The NB STEMSTER III is a strong, efficient and reliable harvester concept for wholerod harvest of SRC as willow and poplar. 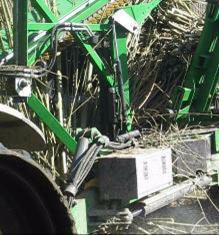 Nordic Biomass has acquired unique experience in relation to the development, construction and servicing of harvesting machinery for willow. A number of harvesters have been developed with financial support from domestic and international development funds. In addition to many years of both R&D and commercial contract harvest in Denmark and abroad. To see some of the prototypes and former harvesterconcepts, visit our Old Nordic Biomass webpage here. 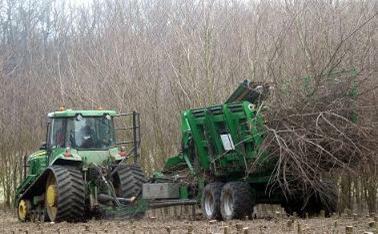 Willow can either be harvested as rods or by using ‘direct cut and chip’ harvesters as the Claas concept. Wet woodchips are however not posible to store. Wholerod harvested material can be chipped during summer with a water percentage around 18-25% - and then stored and sold, whenever it may suit you, eg. when the price is right! Moreover, dry and high quality chips are in general better priced than wet chips. The STEMSTER has been developed for harvest of min 3-4 years old trees. The philosophy is to harvest not so often but to yield high outputs when you harvest. For technical specification on the STEMSTER MK III, press here.